With nine National Championships, three Brazilian Cups, and one Copa Libertadores, Sociedade Esportiva Palmeiras is the most successful Brazilian club of all time. Due to its rich history and tradition, Palmeiras is also one of the most popular clubs in the country, with approximately 18 million supporters. The club is often recognized by its traditional green jerseys and their two mascots: a parakeet and a pig. 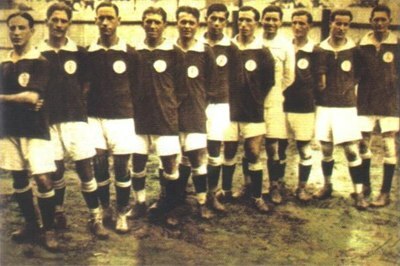 The first Palmerias (Palestra Italia) team to win Campeonato Paulista. As the game of football was starting to take hold in Brazil, a group of young Italians decided to start their own club. The main idea was to form a club that would represent the Italian community. In 1914, 46 interested individuals formed the club under the name of Palestra Italia. They played their first official game in the city o Votorantim, beating Savoy 2-0. Two years later, they joined the official São Paulo State Championship. In 1917, Palmeiras faced Corinthians for the first time, laying the foundation for one of the greatest rivalries in Brazilian football. Much to the chagrin of Corinthians fans, Palmeiras won the initial two games 3-0 and 3-1. Soon thereafter, the club moved to the Palestra Italia Stadium, which would be their home until 2010. In the midst of WW2, the Brazilian government decreed that football organizations were forbidden from using names related to the Axis powers. The club responded by changing its name to Palestra São Paulo, but that wasn’t enough to soothe the political pressure. During a heated meeting the night before the deciding State Championship game, Dr. Mario Minervino suggested the name Palmeiras, which was accepted by the board of directors. The next day, Palmeiras players walked onto the pitch carrying the Brazilian flag. They were to play São Paulo Futebol Clube, who were reportedly laying claim to the Palestra Italia assets. With the score 3-1 in favor of Palmeiras and another penalty being whistled in their favor, the SPFC called its team off the field. In response, Palmeiras players began celebrating their title. This period of dominance was also recognized by the Brazilian Sports Federation, which decided to “borrow” the entire Palmeiras team for the grand opening of the Minerão Stadium. Representing Brazil in an official Inconfidência Cup match, Palmeiras defeated the Uruguayan national team 3-0. Estádio Palestra Itália (a.k.a. 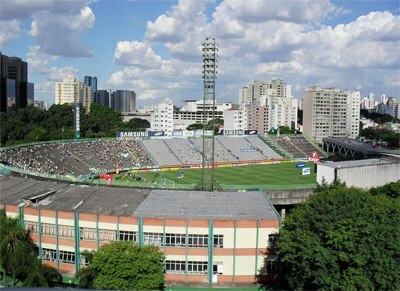 Parque Antártica), home ground of Palmeiras for many years. Following a significant title drought during the 80’s, Palmeiras supporters were getting quite desperate. However, the club’s fortunes changed after signing an 8-year sponsorship deal with Italian giant Parmalat. This led to Palmeiras becoming the richest club in the country, putting them in a great position throughout the 90’s. Led by stars such as Marcos, Edmundo, Zinho, and Rivaldo, Palmeiras stormed their way to two Brazilian Championships (1993, 1994) and one Brazilian Cup (1998). This generation’s crowning achievement, however, was winning the 1999 Copa Libertadores. In the final match, Palmeiras defeated Deportivo Cali on penalties, fighting back from a 1-0 loss in the first leg. Despite these great victories, the club neglected to prepare for the future. Not long after the Parmalat sponsorship ended in 2000, Palmeiras was relegated to the second division of Brazilian football for the first time in its history. However, they managed to win the league the very next year, immediately returning to the top echelon. In 2014, the club celebrated its centenary year by moving to the Allianz Parque stadium. After winning two more Brazilian Cups, Palmeiras made another run at the league title in 2016. Led by Gabriel Jesus, the team put in a dominant performance, leading the league for 29 consecutive rounds. With a 1-0 victory over Chapecoense, they managed to secure the title before the final round. The circular crest was adopted in 1919, before that only a “P” was used. The stylized “P” has remained in the crest although that the text “Palmeriras” plus eight stars have been added after a redesign in 1959. Another design was made in 1977 by which the text of the team became bolder and larger. 1914 The club is established as Palestra Italia. 1920 First time winner of the Campeonato Paulista. 1942 The club is renamed to Sociedade Esportiva Palmeiras. 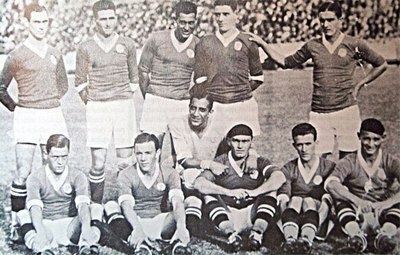 1960 First time winner of the Brazilian first division. 1998 Winning their first Copa do Brasil. 2002 Relegated to the second division for the first time. 2014 The club move to the Allianz Parque.